In what is likely to result in another legal showdown over immigration, the Trump administration is seeking to set down new rules that would allow government officials to detain children in immigration detention facilities — this time accompanied by their undocumented parents — for longer periods of time than currently allowed. After the outcry that resulted over images this summer of children in detention deliberately separated from their parents, the administration has been moving toward detaining undocumented families, children and adults, in the same detention space. On Sept. 7, the Trump administration proposed “to amend regulations relating to the apprehension, processing, care, custody, and release” of children in immigration detention. The proposed changes would mean that government officials could detain a parent and child together for long spans of time, even though a previous legal agreement said a child in an immigration detention center could not be held for longer than 20 days. 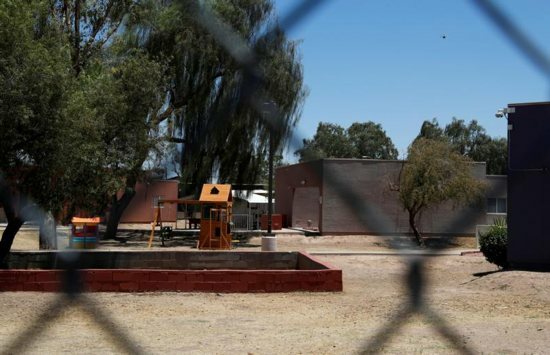 The proposal would essentially nix a long-standing legal agreement put in place in 1997 to ensure the safety and care of children in immigration detention settings. Known as the Flores Settlement Agreement, or Flores agreement, it not only spells out the time period children can be kept in detention, but also mandates the type of conditions facilities must provide, including sanitary, temperature-controlled conditions, as well as access to water, food, medical assistance, ventilation, adequate supervision and contact with family members. The Trump administration said it could provide “similar” protections and standards and make sure “all juveniles in the government’s custody are treated with dignity, respect and special concern for their particular vulnerability as minors,” and therefore terminate the agreement. Those who work with and support migrants and their plight fear that the administration’s move to do away with the Flores agreement is setting up to move into large-scale detention of migrant families. Depending on the number of families detained, that could mean detaining them at military bases or in tent cities. “I don’t know where they’re going to detain them,” said Kevin Appleby, senior director of international migration policy for the New York-based Center for Migration Studies. Technicalities aside, the government shouldn’t be in the business of detaining and prosecuting families seeking refuge, Appleby said, and should be going after smugglers and other criminals instead. Where families could be detained is a key concern. Detention facilities that keep children have to be licensed under the current agreement. Presently, there are only three family immigration detention facilities in the U.S., one in Karnes City, Texas, one in Dilley, Texas, and another in Leesport, Pennsylvania, which together have 3,335 beds, according to background information provided by the U.S. Conference of Catholic Bishops’ Migration and Refugee Services. Migrant advocates such as the bishops’ Migration and Refugee Services say efforts to change standards for facilities appropriate enough to house children are “very concerning” given the potential for long-term trauma that can result from child detention and potential inhumane conditions at detention centers. Ashley Feasley, director of policy for the USCCB’s Migration and Refugee Services, was involved in family reunification efforts in the summer of 2018, and said the agency plans to comment on the administration’s proposed regulations, but there’s a great concern about the lack of mention of alternatives to family detention. Catholic groups are “vital” to any solution, she said, as they helped with short-term housing and as places to reunite families separated by the government in 2018, also offering case management and legal orientation. Those helped by organizations run or affiliated with Catholic organizations showed that migrant families can comply with legal proceedings and be treated humanely, Feasley said, adding that detention need not be the only policy tool. “Families don’t need to be detained large-scale,” she said. Catholic Church agencies and officials will likely join efforts against the administration’s move to detain families, largely because the church is opposed to the detention of children. The Vatican Dicastery on Migrants and Refugees has said that holding children in facilities is never in a child’s best interest. The solution that needs to be championed is to get rid of the “zero-tolerance” policy Attorney General Jeff Sessions enacted earlier in the year, said Appleby, and which only led to a humanitarian crisis, while not deterring border crossings.